Bookings now being taken for 2019 - Book Now ! Two beautiful holiday villas to rent in Plan de la Tour in the South of France, near Ste Maxime and St Tropez. Situated in a beautiful provencal village, each villa has 2 bedrooms, a private terrace and a shared pool and they are all near the beach, countryside and local villages - perfect for your next holiday in the South of France. We would like to welcome you to our three provencal villas in the picturesque village of Plan de la Tour, in the South of France, just a few minutes drive from the coast and beaches of Ste Maxime and close to St Tropez in the sunny South of France. The villas are an easy one hour drive from Nice airport (full instructions provided) and just 15 minutes to the nearest of the many local beaches. All the villas are in the centre of the village of Plan de la Tour that offers many great restaurants, shops, a bar and three boulangeries (bread shops for the fresh, morning croissants and just a few minutes walk away) - all you could need for a perfect French villa holiday near the beach. La Petite Maison sleeps 4 in 2 bright and fresh oak-beamed bedrooms (1 double, 1 twin) and with a large living area on the ground floor with large sofas. The villa provides excellent living space, is superbly equipped and has an unbeatable location in a small development of pastel painted cottages and villas around a shared child safe swimming pool and separate children's pool. Prices for one week range from £395-£995. The property is slightly raised above the village of Plan de la Tour looking out over the terracotta rooftops of the sleepy village and onto the mountains. Le Petit Pois sleeps 4 in 2 oak-beamed bedrooms (1 double, 1 bunk bed) and also has a well equipped living area with open-plan kitchen. The compact but well equipped cottage / villa offers excellent living space, superb facilities and an unbeatable location in a small group of pastel painted cottages and villas around a shared child friendly swimming pool. Prices for a week range from £295-£695 and it is just a couple of minutes walk from the village centre and is by the side of a vineyard. Both our villas have secure child friendly fenced/ secure pools and the properties themselves are also baby friendly/ child friendly/ infant friendly too. Cots and child gates may be hired if required (in advance). 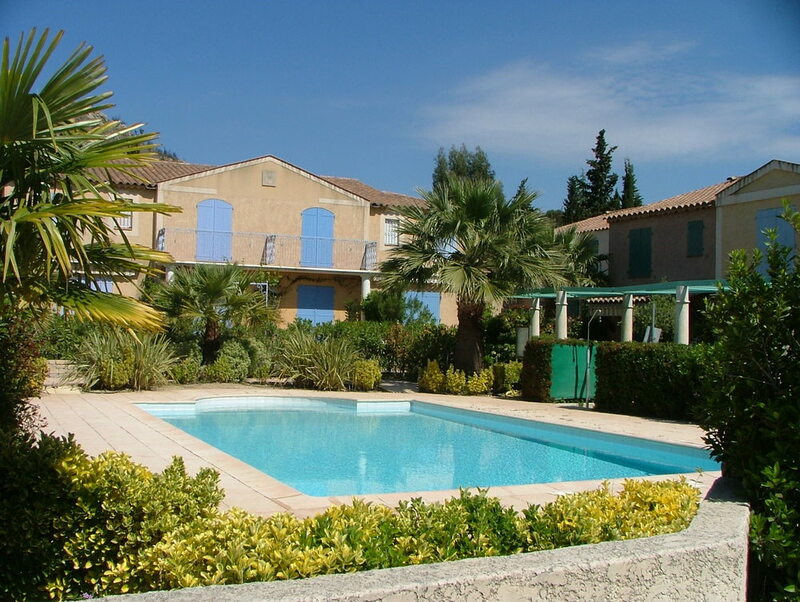 Plan de la Tour, near Sainte Maxime and St Tropez really is a perfect village location for a family holiday and to rent a villa in the South of France. Plan de la Tour is an authentic, friendly and traditional south of france village with several boulangeries-patisseries, six restaurants, a village bar & cafe and a creperie. The villas are only a few minutes by car from many stunning and safe beaches, local mountains, forests, golf courses and of course the fabulous coastal towns of Ste Maxime and St Tropez and all of their colour and bustle in the summer. The village has a children's play area and boules area as well as public tennis courts. Nearby (5 minutes drive) is an Aqualand and lots of outdoor sports and water-sports facilities. No matter whether you are looking for villas to rent for a holiday in the South of France, an apartment, house, self catering, gites, or a cottage, our villas are perfect for exploring the rest of Provence, the Cote d'Azur, the South of France, the Var and the Gulf of St Tropez, or just unwinding by the pool or on the local beach. And also whether you are looking for a low cost holiday in January, February, March, April, May, June, July, August, September, October, November, or December and it is a cheap and great value lastminute/ last minute/ late booking or you are planning ahead for next year, please book quickly as many dates are being booked now - book a memorable holiday in the South of France today ! We have been running our villa rental business since 2003 and been listed on HomeAway since 2004 so you can book with confidence !